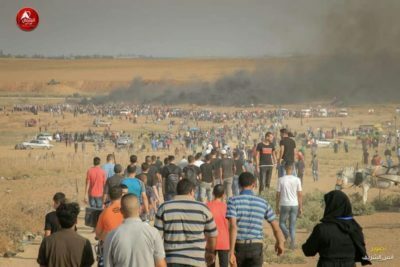 Three Palestinians were killed and 376 others injured by live bullets, rubber-coated steel bullets, concussion grenades and tear gas canisters fired by Israeli forces at the latest ‘Great March of Return’ protests at the Gaza-Israel border on Friday. According to the Palestinian Ministry of Health, the Israeli troops fired live bullets and rubber-coated steel rounds at the protesters who gathered at many encampments along the border, killing three protesters and injuring 376 others, including 134 by live gunfire, including 32 children and five women. Seven of the cases were described as critical. Al-Mezan Center for Human Rights said the soldiers killed Mahmoud Akram Abu Sam’an, 23, with a live round in his chest, east of Gaza city. The Palestinian was from the Nusseirat refugee camp, northeast of Deir al-Balah, in Central Gaza. 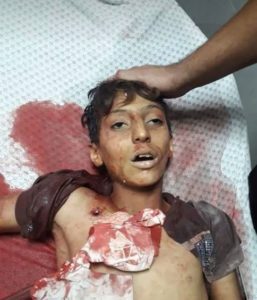 It added that the soldiers also killed a child, identified as Fares Hafeth Abdul-Aziz Sarsawi, 12, with a live round in the chest, east of Gaza city. The child was from the Sheja’eyya neighborhood in Gaza. The third Palestinian was identified as Hussein Fathi al-Reqeb, 18, from Bani Suheila town, was shot with a live round in the abdomen, east of Khan Younis, in southern Gaza. It is worth mentioning that Roqeb suffered from a Brain Atrophy. A number of the wounded protesters had to be rushed to the hospital, while the rest were treated in field clinics. An ambulance en route to the hospital was directly targeted by an Israeli teargas canister, which caused damage to the ambulance. 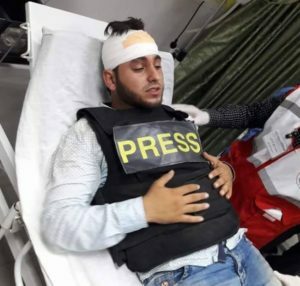 in addition, the al-Mezan Center said the soldiers targeted journalists and medics, seriously wounding a medic identified as Mohammad Nidal Abu ‘Aassi, 27, with a live round in the chest, east of Khan Younis, in southern Gaza, before he was rushed to the European Hospital. It added that the soldiers also shot a volunteer medic, identified as Tasneem Fathi Hammad, 20, with a gas bomb in her right leg, and volunteer medic Mohammad Samir Za’anin, 30, with a gas bomb in his head, in Jabalia, in northern Gaza. The army also fired gas bombs at ambulances, causing damage to at least one ambulance, east of Gaza city. In addition, the soldiers also shot a photojournalist, identified as Dua’ Farid Zo’rob, 20, with a live round in her leg, east of Khan Younis, journalist Khaled Ramadan al-Aswad, 21, with a live round in his left leg, photojournalist Mohammad Hazem al-Masri, 20, with a gas bomb in his head, photojournalist Mousa Soheil Oleyyan, with bullets’ fragments in his arm, east of Jabalia in northern Gaza, and journalist Mohammad Emad Za’noun, with rubber-coated steel bullets in his right leg, east of Gaza city. Since the weekly protests began on March 30th, 2018, Israeli forces have killed 198 Palestinians, and wounded more than 22,000 – more than 4,000 of them wounded with live ammunition fired by Israeli soldiers toward the demonstrators. Many of the casualties – more than 60 – occurred on May 14 when Israeli forces attacked Palestinian protesters marking the 70th anniversary of Israel’s occupation of historical Palestine and the ensuing ethnic cleansing of half a million Palestinian refugees.